How do I upload personal photos and what is art store subscription on The Frame? Photos can be uploaded from your phone via Samsung Smart View App or you can connect a USB drive to the One Connect box. You can select images to display from My Collection on your Frame TV. Both personal photos and purchased artwork are saved on My Collection. Frame TV comes with 100 Samsung collection of exclusive artwork. You can add your photos captured from mobile devices and save them to My Collection or download artwork from the Art Store. Subscription to Art Store can be made to get full access to all the available artwork. Please note: Refer to Art Store for offers and change in subscription charges. 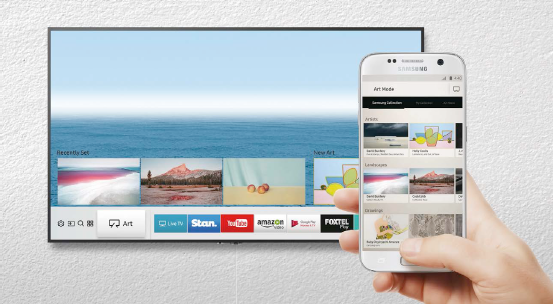 Collages can only be made on the Smart View app and sent to the TV. All collage matte styles can be set to all 10 colour options.